Parking.com offers convenient parking near Flushing's Kissena Boulevard. Parking is available just steps away from the #7 train, LIRR Port Washington Branch, and MTA buses. Click on the map shown for more information on daily and monthly parking options. Kissena Boulevard is one of the oldest roads in Queens that connects the neighborhoods of Flushing and Jamaica. 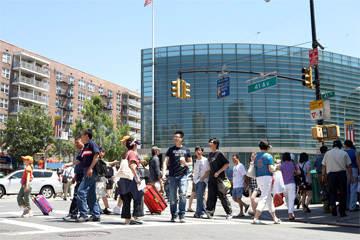 The neighborhood is home to a diverse population consisting of Chinese, Korean, and Indian communities. Many ethnic restaurants, supermarkets, and local businesses can be found in the area, in addition to schools, apartments, and places of worship. Within a short walk from Kissena Boulevard is the Queens Library at Flushing Main Street and Queens Botanical Garden.